While everyone spent their Holiday breaks blindfolding themselves after watching “Bird Box” on Netflix against the advice of the streaming service, Netflix also rolled out an interactive standalone Black Mirror movie on Dec. 28. The interactive movie allows viewers to choose the ending. “Black Mirror,” the speculative fiction series that encouraged people to be wary of new technology, is now hoping they will embrace it. 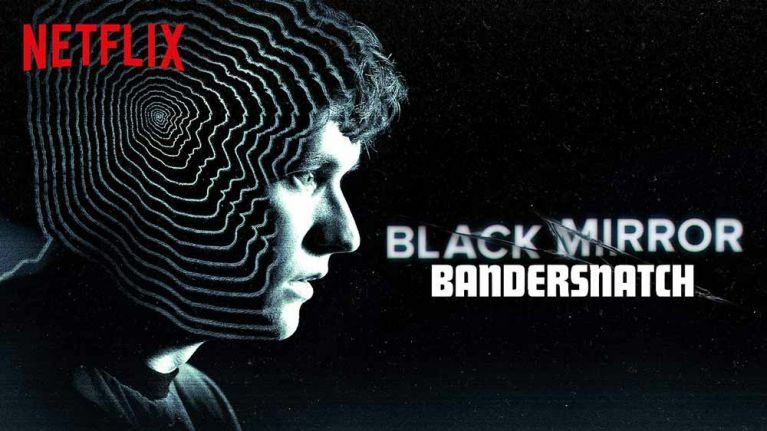 The Netflix show released just one episode on Friday, a narrative titled “Bandersnatch” during which the viewer decides what will happen next. Source: NY Times, Read More Here. Why It’s Hot: As more and more streaming services vie for the same pieces of the pie, services like Netflix and Hulu are constantly looking for ways to be the next most talked about show. If “Black Mirror Bandersnatch” does well, interactive long form content may be the next big thing for entertainment, much like what “Avatar” did for 3D, and what Pokemon Go did for AR. Stay Tuned. The Future is Bright. To promote the new season of Narcos, Netfrecentlynlty launched Narcos: Cartel Simulator, a game created to be played fully within the Facebook Messenger app. The game takes place in 1994, and the aesthetic was drawn from games designed for graphing calculators and other LCD screens in the ’90s. In the new Messenger game, you play a small-time drug dealer who owes money to the Cali Cartel. It’s essentially a game of supply and demand, as you travel drug marketplaces around the world, trying to buy low and sell high. Facebook Messenger is popular among mobile users and quite easy to build within making it a great platform to promote things like new television shows on. The Messenger interface is perfect for a game like this, with most options, served to users as text-only multiple choice. Despite the minimalism, there’s enough to keep you engaged and, in the opening gameplay, quite stressed about your fate if you fail to give the cartel its due. Design comes in all shapes and sizes. In everyday life we interact, and react to visuals, interfaces and even touch and smells. But what about sounds? Earcons, or sonic branding is an often overlooked part of an experience, yet each one of us associates certain sounds with brands, events or actions. Leveraging senses is a key way for psychological recall and in a world of “noise,” designers need a way to identify and alert beyond just visual queues. Lost? earcons are everywhere. From the iconic Windows startup sound to the omnipresent “iPhone typing” clicks, sonic branding remains an important element of interaction, design, and branding. Brands have the opportunity to take their branding to another level with earcons. As seen with NBC, Netflix and T-Mobile, an earcon can cut through and identify a brand even if you don’t see it visually. This use of the senses works to leverage human psychology to not only increase recall but lead to affinity and familiarity. Netflix just released the third season of the Narcos this past weekend. The only hitch? Everyone in the world knows Escobar, but not so much the Cali Cartel — the massive drug organization that ran its organization like a stealthy corporation around which the third season centers on. 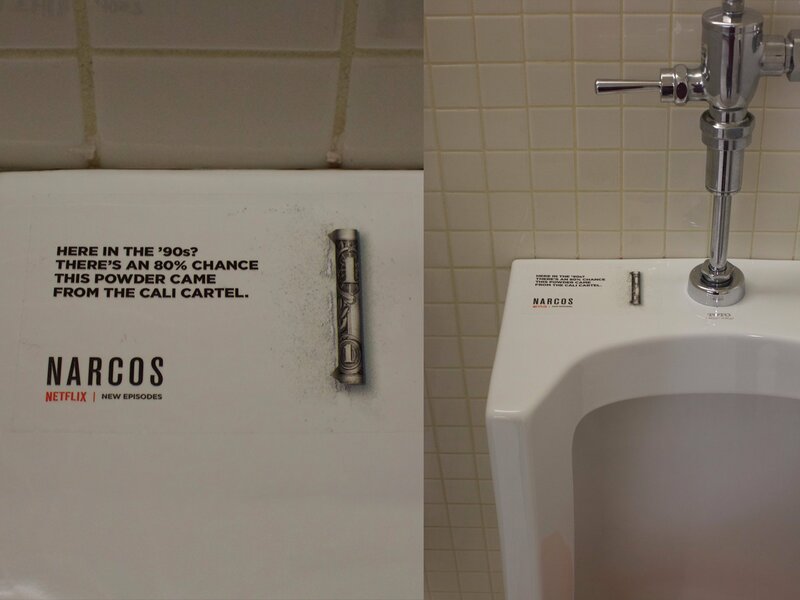 Netflix has been plastering what would have been cocaine hotspots in the ’90s, aka bars and clubs and their bathrooms, with punny one-liners and facts about the Cali Cartel to educate viewers and build excitement around the latest season. The streaming giant has placed stickers and coasters in locations across over 160 bars and hotspots in Los Angeles, Chicago, New York and Miami, where unknowing Cali Cartel customers may have used their product in the ‘90s. The campaign began rolling out Sept. 1. The contextual ads follow the same approach that Netflix has adopted in previous seasons, using fact-based campaigns and utilizing statistics to illustrate the storyline. Last year, before releasing the show’s second season, for instance, Netflix launched a Tumblr site called ‘Narcopedia’, an interactive experience that took viewers through the history of cocaine and provided in-depth information on the war on drugs. The approach seems to be working. According to data crunched by social analytics firm Brandwatch, while there has been some mention of viewers “missing Pablo” online, the Cali Cartel is gaining prominence, with over 7,000 mentions over the past month versus “Pablo Escobar,” which has about 2,300 mentions. The last notable OOH contextual campaign I remember for OK Google was entertaining and insightful. It’s refreshing to see marketers having a good time with non-digital channels. And also notable that they are measuring it via social chatter — as often times we question how “stunts” can show measurable ROI. Netflix announced an experiment in interactive storytelling earlier this week with the children’s programs Puss in Book: Trapped in an Epic Tale, and Buddy Thunderstruck: The Maybe Pile. 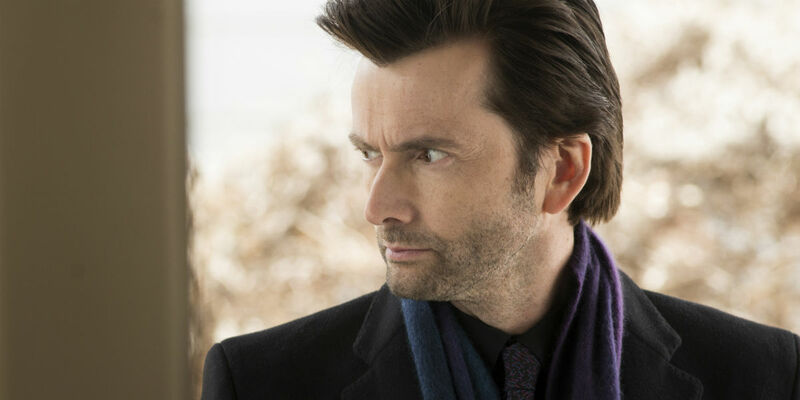 The shows, which offer thousands of permutations, bring the “choose your own adventure” format to internet TV and give the chance for the viewer to be the director. Netflix has proven an ideal platform to test this out on for a variety of reasons: its large user base, its original programming and the fact that a show does not need to start or end at a certain time. It works like this: at certain, predetermined points in the story, Netflix pauses the tale and offers you a choice. Should Puss (from Shrek) befriend the bears he just encountered, or fight them? Your choice dictates his next move, and changes the arc of the story. Puss in Book offers viewers 13 opportunities to shape the story, which features two possible endings. It can be as little 18 minutes, or as long as 39. There are three thousand possible variations of how the story could go. Buddy Thunderstruck will provide eight opportunities to make a decision, an average length of 12 minutes. Increases data points: this could create a large amount of data for Netflix regarding: how many people are making active choices, what choices, are they re-watching the show at a later point in time? It’s a choose your own adventure… for your favorite TV shows. Frank Underwood steps down and donates all his worldly goods to charity. This is not only a great way to give your audience exactly what it wants, but gives Netflix a greater understanding about its consumers in terms of data. It’s also an out of the box way to do TV that none of its competitors can try. Netflix has been on the cusp of innovation, allowing downloads outside of wifi, expanding the range of what a streaming content provider is expected to produce. By always adapting to the new media landscape they are almost determining how it rolls out. They don’t let history effect their business, they change the scope of the expectations among their competitive set. MindFlix is an experimental headband that lets wearers scroll through and select titles on the service with only their thoughts. Wouldn’t it be great if Netflix could just read your mind and pick out the exact thing you were in the mood for? The technology’s not there yet, but if MindFlix is any indication, that future is not far off. During a 24-hour hack day, Netflix employees were tasked to come up with projects centered around the service. MindFlix is one such project, using a special brainwave-reading headband made by Muse, allows users to scroll through and select items the interface through simple head movements and thoughts. For example, once the wearer decides on what they want to watch, they simply think ‘play’ and the selection starts on screen. It does this by sensing back activity and linking it to pre-selected actions, making finding something to watch easier and faster than ever. We’ve been talking about Voice Recognition as a trend, but what about mind recognition? The execution here may be a little silly, but what about implications for health, emergency situations? Will there be a time where we have to recall that we used to have to touch things? 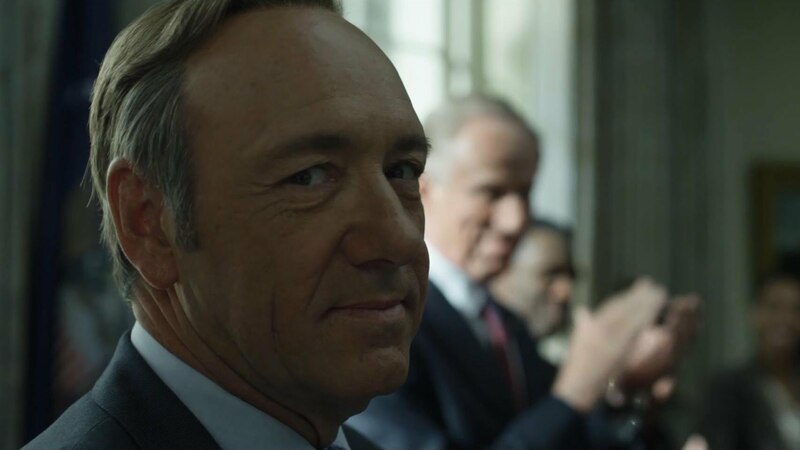 House of Cards premiered its Season 4 trailer during the GOP Presidential Debate. The trailer was a spot for the re-election of Kevin Spacey’s character, Frank Underwood, that parodies a Reagan campaign ad. They also launched a campaign microsite that resembles many real presidential campaign sites. 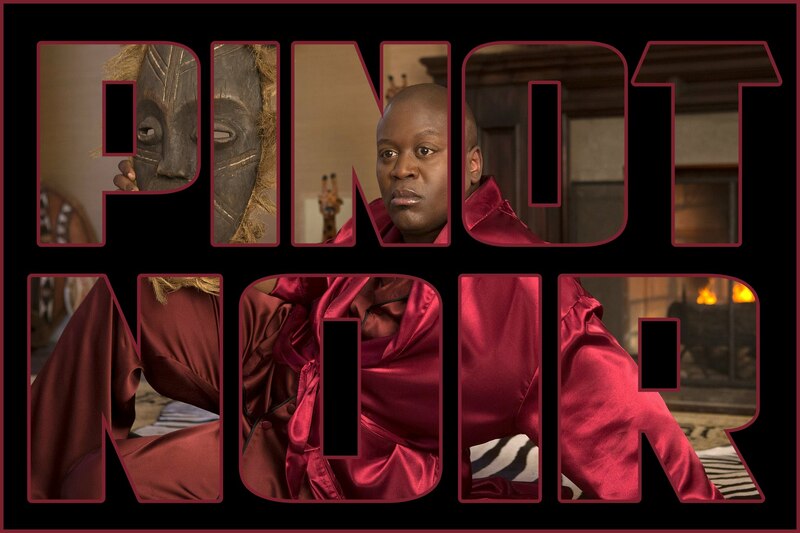 I won’t reveal any spoilers, but there is a great easter egg on the site for fans of the show. Not only have streaming services become a force of nature in original programming, but their marketing campaigns have definitely been noteworthy and attention-grabbing. Earlier this year, Amazon fell under some heat for a subway ad campaign that featured Nazi and Imperial Japan iconography. With the upcoming presidential election attracting lots of attention, Netflix could not have chosen a better time to air this ad. 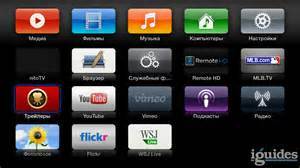 Streaming services ability to continuously innovate is only expediting the downfall of broadcast TV. This became especially apparent as only one broadcast TV show was nominated for the upcoming Golden Globes. The third season of House of Cards showed up online long enough to freak out the entire Internet. Netflix said an internal bug caused the full third season of the show to momentarily (25 minutes) show up weeks early. Their version of damage control on social, was BRILLIANT. A great demonstration of using every opportunity (even the unfortunate ones) to think and act creatively. Check into most hotel rooms today and your TV viewing choices consist of local channels and standard cable fare such as the Weather Channel, Discovery, USA, etc. But none of the streaming networks that you can’t get with ordinary cable are available So no Netflix, Hulu, or Amazon. Marriott is currently considering payment options — possibly as part of a premium Internet package or as a separate charge to stream each network — one for Netflix, one for Hulu, etc. For now, Marriott is allowing guests in test locations to log in through their own subscription accounts for streaming content, as noted by this Twitter post. Wow. I’m impressed. The Marriott TV system they have here allows you to log into Netflix, Hulu, etc for free with your own account. With the popularity of streaming content providers, it’s no surprise that hotels are trying to monetize it. What better way to relax from a business trip than binge watching your favorite series or relaxing the kids after a day at Disney than their favorite shows on Hulu? It also a win for Netflix and others, who can open up new revenue opportunities by streaming their content not to a single household at a time, but a hotel’s worth of a hundred guest rooms. Look for this idea to rapidly take off. Last September, Netflix enabled people to privately recommend content to their friends on Facebook. Now, Netflix has expanded that private sharing capability to Android users, who can now send and receive recommendations right from their phone. The service is also integrated with Android Wear-powered smartwatches: issuing an alert to users who can then use their phone to watch content, thank their friend, or view details about the show. Great example of a brand identifying their customer habits, in this case, privately recommending content to friends, and providing an integrated means of doing so across social, mobile, and wearables. 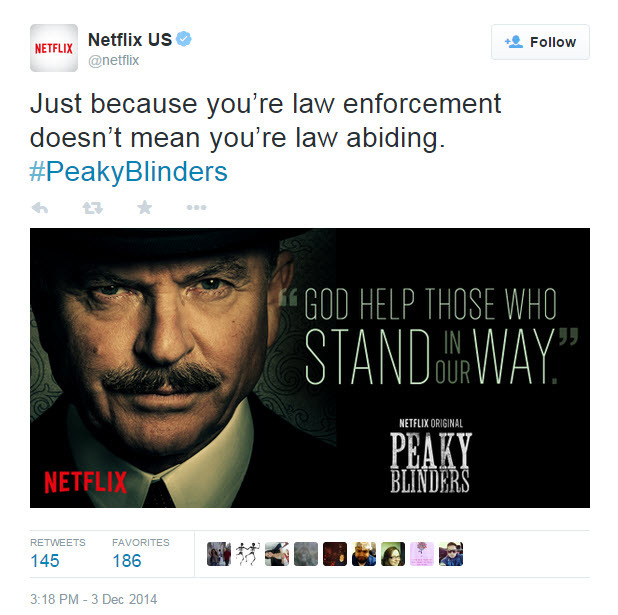 As Twitter was erupting this afternoon with outrage over a grand jury’s decision not to indict the NYPD officer whose chokehold killed Eric Garner, Netflix made a rather odd marketing decision. While the tweet didn’t spark much real anger at Netflix, it did draw a mixed reaction from those who felt the company was siding (intentionally or not) with protesters and others who felt it was simply insensitive. Time and time again, brands fail to stay abreast of current events and find themselves part of conversations they didn’t intend to be. It’s a rookie mistake that can compromise the way a brand is perceived in the industry and the social community and a reminder to others that it is imperative to research trending hashtags, current events, and keep a point of view of “How will the social community react to this tweet?” whenever publishing content. It’s not about how great the Social Media Manager thinks the tweet will perform, it’s about how the audience will react. Netflix has launched a series of outdoor advertisements to the enjoyment of TV and movie lovers in France..
For its entry into France, Netflix installed a series of digital posters, frames that display a simple GIF of an iconic scene from a move or television show. Examples include Walter White donning his sunglasses to take on his Heisenberg persona and Watson from Sherlock expressing disbelief. Taking the concept to another level, the Netflix ads respond to local events — for example showing an exuberant dance scene from Orange is the New Black to announce a French soccer victory, or the scowling police officer from Fargo in the case of a defeat. The GIF posters also respond to weather. Walter White dons his sunglasses in response to bright light, and King Leonidas from 300 shelters beneath his shield in the rain. Netflix has created more than 100 different GIF files, each of which can be played on any of the viewers they’ve positioned in public spaces throughout France. The electronic posters are supported with video ads on YouTube and the Netflix website. Cool outdoor advertising seems to never get old, and it’s fun to see both innovation and simplicity in action. One would think that Netflix doesn’t need to advertise at this point, but they have a strategy to break in to new, more difficult markets that helps bring their offerings to life. This week, I came across two interesting stories, that both are grounded in new ways to distribute content and insights about your audience. 1. Adam Sandler has agreed to produce and star in four feature films that will be released exclusively on the Netflix. The deal is yet another effort by Netflix to bolster its content portfolio, and one that is expected to be a hit with users. Sandler is one of the few actors whose films consistently rank among the most viewed by subscribers, Netflix said.”His appeal spans across viewers of all ages — everybody has a favorite movie, everyone has a favorite line — not just in the U.S., but all over the world,” said Ted Sarandos, the company’s chief content officer. 2. Lions Gate and Stephenie Meyer, the creator of the vampires-and-werewolves “Twilight” saga, on Tuesday announced plans to select five aspiring female directors to make short films based on “Twilight” characters. The mini-movies, financed by Lions Gate and its production partners, will be shown exclusively on Facebook next year. “We think Facebook is a great way for us to introduce the world of ‘Twilight’ to a whole new audience while re-energizing existing fans,” Michael Burns, Lions Gate’s vice chairman, said in an interview. The effort reflects the manner in which Hollywood is maintaining its most valuable film properties between sequels and prequels and remakes. In the past, studios barely kept a pilot light lit, forcing marketing teams to constantly reactivate cold fan bases. Now the savviest studio marketers are using Facebook, Tumblr, YouTube and other online platforms to keep fans on a constant low boil. I’m interested to see the different ways in which movie and TV content are both created distributed going forward. These two examples show how understanding audience behavior (actor preferences, social media habits) can drive innovative solutions. Unlike the advertorials of yesterday, Netflix’ sponsored content feature on Wired.com deserves to be editorial; is the type of content that you would think Wired would be proud to publish. In “TV Got Better”, Netflix explores how digitization changed the entertainment industry; allowing for greater creativity and risk-taking, giving rise to unique programming like “orange is the new black” and “house of cards”, and genres, that wouldn’t find a home in yesterday’s prime-time line-up of silly sitcoms. Far more than a flat editorial, this content piece includes an interview with the creator of Arrested Development, an infographic that updates in real-time with Twitter conversation data (above) and an interactive timeline, showcasing milestones in TV history. Not only is the interactive, smart content right at home with Wired, but the tone and vocabulary are carefully crafted for this audience, with words ranging from “scatological” (I had to look it up) to “cringier” (they made it up), and lots of esoteric references that readers would be proud to “get”. It even teases the audience a bit for taking itself so seriously, “We continue to torment ourselves with the idea that it is merely entertainment, something beneath our dignity”, while using “we” (vs. “you”) to imply that Netflix and the Wired audience are “one”. While Netflix does mention its own name at the very end of the piece, it seems unnecessary, since Netflix and/or a few other digital video producers/distributors are likely at the forefront of every readers’ mind by this point, which is the goal! Why it’s Hot: With “branded interactive content” named one of 3 marketing trends that is about to change the industry, marketers and agencies are going to be seeking great examples to learn from and emulate. 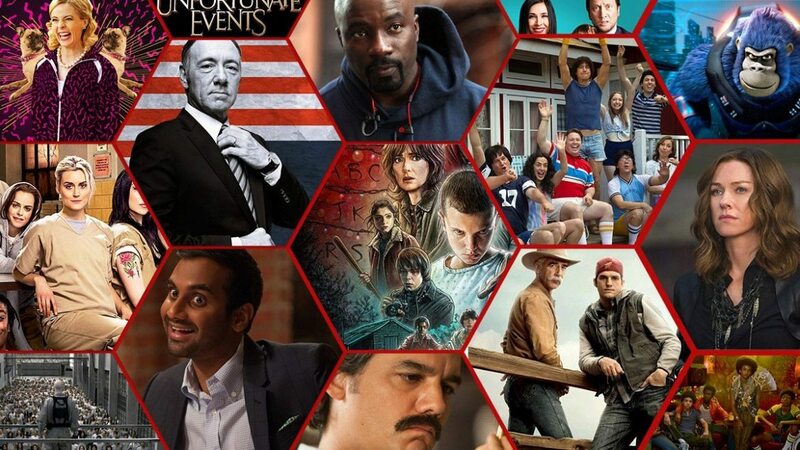 Netflix “TV Got Better” is at the top of my list! The Walt Disney Studios has launched its much-anticipated cloud-based service that lets users purchase Disney, Marvel and Pixar movies for streaming on TVs, desktops and mobile devices. The Disney Movies Anywhere service, which is free, is closely integrated with Apple’s iTunes and is initially available only on iOS mobile devices. Read more @ The New York Times. Two years ago the company declined to participate in a digital movie storage and management system called UltraViolet, even though every other major film studio signed on. At the time, Disney was worried that families were not yet ready to embrace cloud storage technology. Also, UltraViolet developed partnerships with major digital movie retailers like Best Buy and Walmart, but lacked a direct tie to iTunes, which controls roughly 60 percent of digital movie purchases. Today, digital movie libraries are becoming the modern-day equivalent of rec room shelves lined with DVDs. Disney Movies Anywhere aims to make collecting Disney films easier: buy a Disney, Marvel or Pixar movie once and watch it on any web-ready TV, mobile device or computer. Link your Apple iTunes accounts with the Disney Movies Anywhere website and app.